Violent Friday: Dozens of Palestinians have been hurt Friday in the West Bank and Gaza Strip while marking Land Day protests with fierce riots and clashes with IDF soldiers. Palestinian sources reported that one man was killed and 13 others were injured by IDF fire in Gaza after attempting to breach the border fence and infiltrate Israel near the Erez Crossing. Land Day: Lebanon on high alert. 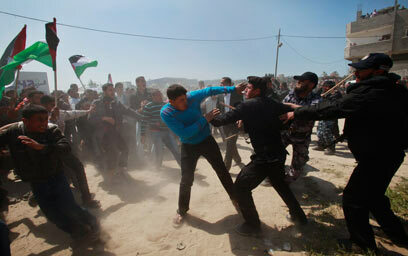 The army confirmed that several Palestinians were hurt in the clashes. 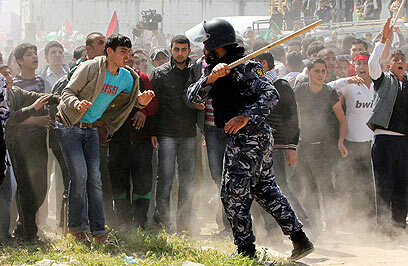 Meanwhile, Hamas security forces attempted to force protestors away from the border fence, using clubs to beat up the rioters. The riots began around 12:30 pm, shortly after Friday prayers, when dozens of masked Palestinian youths began hurling stones and Molotov cocktails at security forces stationed at the Qalandia checkpoint. The forces responded with teargas canisters and deployed the "Skunk" – a vehicle loaded with canons spraying a foul-smelling liquid. In addition, security forces activated a machine that transmits high frequency sound waves in an effort to disperse the protesters. 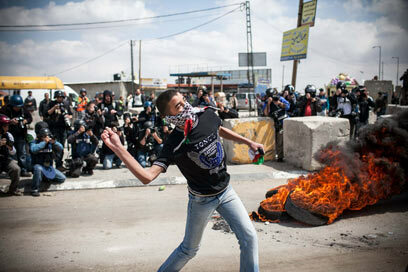 Palestinian sources said at least 30 people were injuried in the clashes. According to reports, Palestinian politician Mustafa Barghouti was hit in the head by a tear gas canister. He was taken to a Ramallah hospital for treatment. The IDF Spokesperson's Unit said Barghouti was hurt in a brawl that broke out among the Palestinians over who would lead the protest march. Elsewhere, Hamas parliament member Ahmed Atoun was lightly injured from a stone that hit him in the head, but did not require medical care. Meanwhile, A few hundred Palestinians gathered near Jerusalem's Near Damascus Gate, some were carrying Palestinian flags. The crowd attempted to stage an illegal procession, but was blocked by police forces. Some 14 protesters were arrested. Earlier, dozens of Palestinian protesters approached the Gaza security fence at the closed Erez crossing. 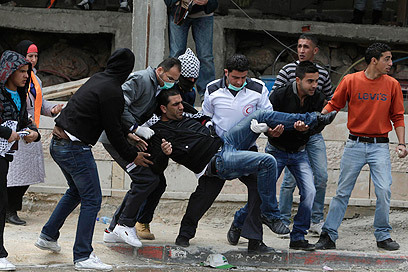 IDF forces responded with tear gas and smoke canisters, and fired warning shots in the air. Red Crescent ambulances were called to the scene after reports of injuries were received. Shortly after, hundreds of Palestinians reportedly left the officers' quarter in Beit Lahia and start to march toward the crossing. Further north, inside Israel, a few hundred people attended a rally marking Land Day in Kafr Kanna near Nazareth and in Tayibe. The protesters waved Palestinian flags and called out for a continued struggle against land expropriation and home demolitions. They also demanded that the fight against racism and discrimination continue. Several teens tried to hurl rocks at vehicles on Route 444, but adults at the scene prevented them from doing so. Jordanian news sites have reported that some 20,000 people are gathering in order to take part in the massive march towards the Israeli border. There is increased security presence in the area. Lebanese newspaper As-Safir reported that 120 buses will be transporting Lebanese participants and participants from Palestinian refugee camps to the Global March on Jerusalem. Earlier, IDF deployed additional police and Border guard forces along the northern border. The forces are equipped with crowd dispersal and anti-riot measures. Police stated that orders were given to the forces to maintain restraint and prevent protesters from reaching the border fence. Chief of Staff Lieutenant general Benny Gantz patrolled along the northern border and held an assessment meeting with division commanders in Judea and Samaria and along the borders with Syria, Lebanon and Jordan. Gantz directed the forces to be alert and act advisedly to ensure the sovereignty of Israel. Coordinator of Government Activities in the Territories Major-General Eitan Dangot arrived at the Rachel's Tomb crossing in south Jerusalem and met with IDF, police and Civil Administration official at the situation room set up in preparation for Land Day. Dangot was briefed on the deployment of forces and coordination with Palestinian security apparatus, and informed about a procession that is underway in the West Bank city of Bethlehem. See all talkbacks "Land Day: 1 reported killed in Gaza "